Following an extensive 125 million renovation leisure and business travelers alike will experience the revitalized bold mid-century modern design that blends classic elegance with the extravagance and warmth of a true luxury lifestyle hotel. The distinguished hotel features select interiors by illustrious designer Ron Arad along with intriguing sculptural furnishings from Italian designer Moroso. The Watergate Hotel boasts 336 stylish guestrooms and suites and 27000 square feet of flexible meeting and event space. 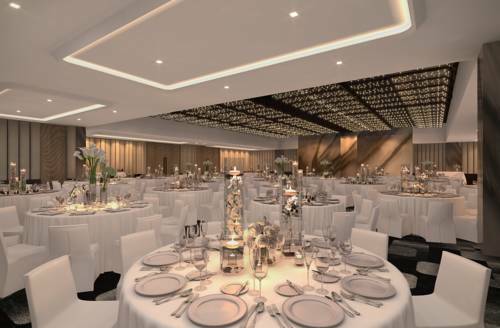 The brand new ballroom is 10000 square feet along with an outdoor terraces overlooking the Potomac River. Both hotel guests and local residents will enjoy access to fine dining and casual cuisine an opulent whisky bar and a spectacular rooftop with 360-degree views in addition to an exclusive spa and fitness facility. Top of the Gate: Perched on the roof of The Watergate Hotel the bar will featured a menu of craft beers and cocktails as well as light snacks. Dual Concept Restaurant: Full service restaurant featuring casual and fine dining options will be available. Reservations are encouraged. Whisky Bar: Our dignified whisky bar that is illuminated by a soft amber glow is filled with a selection of the worlds finest spirits. Bounded on the north by Virginia Ave The Watergate is in the Foggy Bottom neighborhood overlooking the Potomac River. Enjoy striking views of the Potomac as you stroll among historical sculptures on your way to any number of fine dining or shopping destinations. Heading north; a walking/jogging trail connects Foggy Bottom to the Georgetown waterfront. Immediately to the south along the river lies the Kennedy Center and the monuments.